Liberty at sea during sea trials. Liberty in the Turku construction yards of Kvaerner. The private balcony area of the Grand Suite. The vessel in dry dock during construction showing the bow. 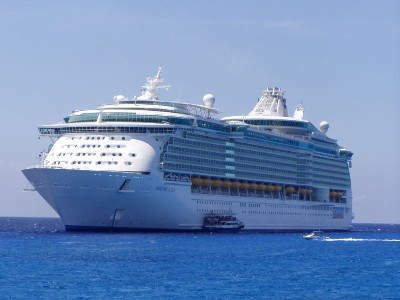 Liberty of the Seas will be the latest in the new generation of super ships for the Royal Caribbean International (RCI) cruise line. 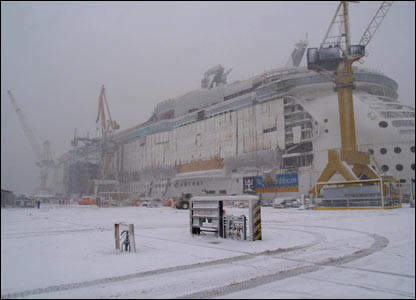 The 4,370 passenger, 18 deck (15 passenger decks), 154,407t ship, was constructed at the Kvaerner Masa Aker Yards in Turku, Finland and is due to sail in May 2007. The Liberty of the Seas will be the second ship in the Freedom class with sister ships Freedom of the Seas (launched in August 2005 and maiden voyage June 2006) and Independence of the Seas (due to be launched in May 2008). The Liberty, along with her sister ships, have been called “the largest, most innovative cruise ships in the world” and are indeed currently among the largest cruise vessels afloat. Liberty of the Seas, which cost an estimated $947m to build, will sail alternating Eastern and Western Caribbean itineraries from Miami. Liberty of the Seas was floated out from the construction yards in August 2006 and will be delivered ready for final sea trials in April 2007. 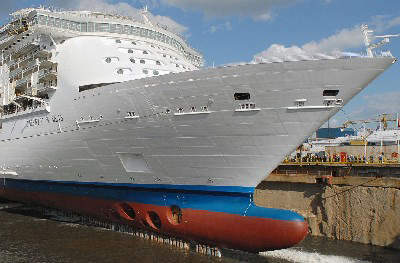 The ship length is 1,112ft (339m), the beam is 184ft and the draft is 28ft (8.5m) with a cruising speed of 21.6 knots. The complement of crew is 1,360 and the ship has a full complement of 30 lifeboats. There are 1,817 staterooms – 842 have private balconies and 172 have promenade views. 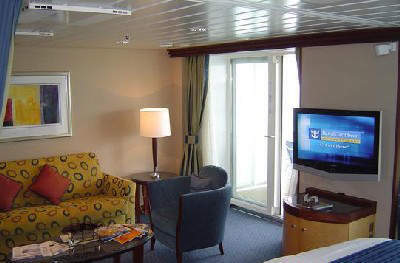 All staterooms are equipped with keypad-operated safes, hair dryers, Wi-Fi Internet access, mini-fridges and full-size, flat-screen LCD televisions featuring a range of channels. The new ship will feature RCI’s signature innovations, including the FlowRider surf simulator, the H2O Zone water park, an ice-skating rink, a rock-climbing wall and a boxing ring. Liberty will also be equipped with cantilevered whirlpools suspended 200ft above the ocean, a Presidential Suite sleeping 14 people, and a comprehensively equipped fitness centre (ShipShape). The ship will also have a special barber shop (A Close Shave), a Ben & Jerry’s ice cream parlour, a coffee shop and bookstore, Sorrento’s Pizzeria and the Portofino Italian and Chops Grille restaurants as well as a Johnny Rockets 1950s-style fast food restaurant. 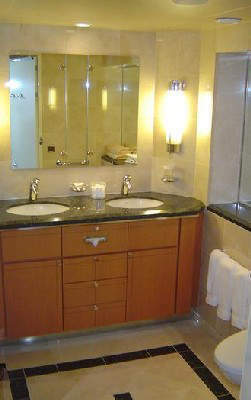 Cabins range from the inside version, to promenades, to the 14-person Presidential Suite. Other features will include Royal Promenade, WiFi capabilities and cell phone connectivity, themed bars and lounges, Adventure Ocean youth facilities, Day Spa and Fitness Centre, Casino Royale (which is open whenever the ship is at sea, and features slot machines in a range of denominations, table games and a bar), sports pool, full-size sports court, nine-hole miniature golf course and Vintages wine bar, which hosts wine tastings at various times. The main dining room will have three decks (Leonardo, Isaac and Galileo) designed to accommodate all passengers in two sittings with gold leaf trim on the balconies and elaborate crystal chandeliers. The main artery that runs throughout the ship and is common to all RCI vessels is the Royal Promenade. 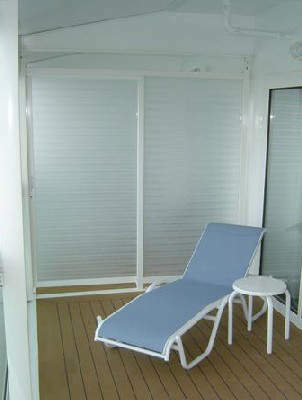 Many of the rooms have identical design to the sister ship Freedom and these include Bolero’s Latin-themed lounge, the Schooner Bar, Pharaoh’s Palace (second theatre), the Windjammer Café (which is set up like a food court), Squeeze (a juice bar that serves energy drinks) and Adventure Ocean. The pub on the Liberty is called the Hoof and Claw, but is the Bull and Bear on the Freedom. The ship’s power will be provided by Six Wartsila 46 V12 diesels each rated at 12.6MW (~17,000 hp) driving electric generators at 514rpm. The propulsion will be provided by three ABB Azipod podded electric propulsion units, two of them azimuthing, one fixed and four additional bow thrusters. The vessel consumes 28,000 gallons of fuel per hour.